There is a saying in the digital world, "it isn't a photo until it is printed". Although I disagree it isn't a photo until it is printed, I do agree there is nothing like holding a print of your favorite image. I call this image timeless because it represents three generations of hands. 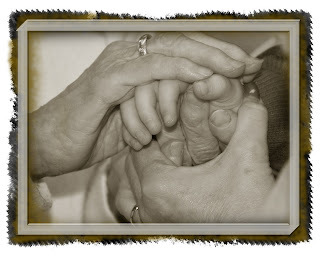 I was shooting an event and noticed the three generations of hands embracing and felt a timelessness about the image. The grandmother, mother, and child all embraced each others hands. [It brings tears to my eyes as I think about it.] A timeless image. I could not pass it up and fired off a few shots. This image proved to be one of my favorite images. I converted it to black and white to create a sense of age. I am not one to rush holidays but before we know it Christmas and all the joy it brings will be upon us. However, too often we wait till the last minute to find a great gift for those we love. There is nothing wrong with planning now for the gifts you want to give during the holidays. A mouse pad with your favorite image is always a very nice gift. I use smugmug or mpix for my prints and other photo gifts. Both sites offer free software to create books, cards, calendars, etc. Last year, I created a book I called "The Year in review" [I think I heard that title on a commercial somewhere :-] ] and gave it to my parents as a gift. It covered mid 06 to late summer of 07 and it was a hit. Why? Because it was some fancy production? No, because it contained many images of the family in print. Yes, a digital frame is great but they remind me of a video. There are times I just want to stare at an image and embrace what it represents. Mouse pads, photo albums or, calenders with a different picture each month is a great idea too! If you begin to plan now by going through all those memorable images and organize them into a folder on your hard drive, it will be easier when you put them together in a 'timeless' treasure. Back to photobooks. Last year, a long-time friend and work associate retired and I was at the surprise retirment party with camera in hand [of course, isn't there a saying that says 'never leave home without it' or is that something else not leave home without]. Anyway, back to the story. I was able to capture a good number of fun images and compiled them in a photobook [I printed it from mpix] and gave it to her. Well, the tears flowed and hugs given then timelessness took hold again. There is nothing like giving a gift that makes the other person cry. Unless they don't like the gift and are crying because they don't know what else to say and begin to cry. Today's tip: Begin to write your Christmas list and put together all those favorite images in an easy location to find on your hard drive. It will make them easier to find when you create that timeless gift for someone you care about. Oh yea, if all the images are organized it will make it easier to back them up. You do back up your images don't you? More on backing up in future blogs. Go out and capture the beauty of life and share it with others! Ahhh this is a great reminder. Sad but true - winter will be on us before we know it. Last year I had grand plans of printed portfolios, gifts for family, etc. Then time happened but execution didn't. Not this year! Thanks for the reminder.